From offering holiday promotions at your home business to using reward programs, there are several ways you can earn extra holiday cash without having to put in extra hours at the desk. Just in case you haven't heard Jingle Bells playing since midnight on Halloween—Christmas is quickly approaching, and with it, Christmas shopping. Money looking a little tight this year? Now's the time to get a little creative with your budget—and that includes bringing in a little extra spending money. 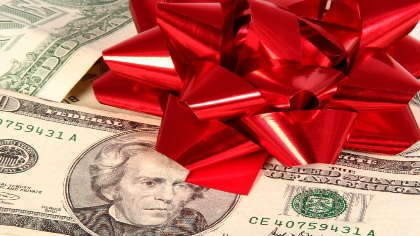 Here's a few ways you might be able to add to your holiday budget this year. Chances are you have items around the house that don't get used anymore. Organize the closets and set aside clothes that aren't worn —and do the same thing with the kids' clothes. While you're at it, gather up the toys that haven't left the bottom of the toy box in months. Selling all of these unused items is a good way to earn a little extra cash, not to mention the fact that it's nice to have closets and toy bins organized before all the Christmas gifts come in. You can try selling these items on Craigslist or a Facebook garage sale group, or take them directly to a secondhand store like Plato's Closet or Once Upon A Child. The Christmas season is a good time to offer additional promotions through a work-from-home business as well. If you sell a product, reach out to holiday gift buyers and entice them with a special. If you offer a service, make sure you're offering gift cards, as they often make good Christmas gifts, too. Get creative and brainstorm ways your business might be able to catch on to some of the holiday shopping. Rewards programs are a great way to earn a little extra cash (or sometimes gift cards). If you haven't spent some time using programs like this year-round, many of them have fast payout that can still help you out in time for this year, like Swagbucks and Bing Rewards. Keep track, though, of how time you put in and what you earn—if it takes you an hour to earn 500 points that translates into $1, you would probably be better off putting more time into your work from home business or position. Now is a good time to clear the shelves of books and DVDs that just don't get used anymore. Amazon's trade-in program allows you to send in used books and DVDs in exchange for a gift card. Local book stores also will often pay for used books. Pay attention to sign-up bonuses—they're often a good way to earn some extra holiday spending money. Often banks will run specials for opening a new account, or store credit cards will offer a significant discount on the first purchase. However, beware of “deals” that may cost you in the long run—don't open a new credit card if you aren't good at making sure it's paid off every month and don't sign up for a new bank account without knowing what kind of fees are associated with it. I know, this is the sixth tip in a list of five, but certainly worth mentioning. It's easiest to save for Christmas year-round—but if your budget is tight, you can also “earn” for Christmas year round. Rewards programs will go a lot farther if you use them year-round. If you're good at managing credit cards, get one with a good rewards programs and don't redeem them until it's time to start holiday shopping. If you do a lot of shopping online, use a program like Ebates. Open an extra savings account and put a little bit aside every time you get a little more than expected from working from home or when you earn a rebate. The holidays should be enjoyable—but when the budget is a little too thin, it can instead turn into a season of stress. Earn a little extra money for Christmas shopping by offering a special promotion in your work-at-home business or earn gift cards through rewards programs. Combine these ideas with a few tips for saving on holiday shopping—like using coupons and starting early—to ease some of that stress this season. Got a way to earn extra Christmas cash not listed here? Share it with other readers in the comments section!